(PhysOrg.com) -- Scientists in the US have developed a new technique that sprays a burn patient's own cells on the burn to help regenerate the skin and drastically reduce recovery time. The gun has been under development since 2008 and has now been used to successfully treat more than a dozen patients. The Skin-cell Gun works essentially like a sophisticated paint spray gun. It was developed by Professor Joerg C. Gerlach and colleages of the Department of Surgery at the University of Pittsburgs McGowan Institute for Regenerative Medicine. 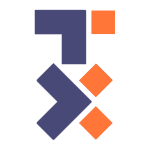 The concept was first introduced in 2008. Until now burns have usually been treated with skin grafts, which involve taking skin sections from uninjured parts of the patients body, or growing sheets of skin artificially, and grafting them over the burn. The grafts can take several weeks or even months to heal, and during the recovery period patients are prone to infections because of the damage to the skin, which is the bodys first line of defense against pathogens. Skin spraying have been in use for some time elsewhere, such as in Australia, where Dr Fiona Wood of the West Australia Burns Unit developed a method called spray-on-skin. Dr Woods method uses an aerosol system to spray on cultured skin cells. This system also cuts healing time to days rather than weeks or months, and the technique substantially cut the death toll in the Bali bombings in 2002. 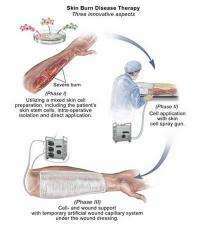 In a process taking only an hour and a half in total, a biopsy is taken from the patients undamaged skin and then healthy stem cells are isolated from the biopsy and an aqueous solution containing the cells is sprayed on the burn. The sprayed wound is then covered with a newly-developed dressing with tubes enmeshed within it and extending from each end. One set of tubes functions as an artery, while the second set functions as a vein. The tubes are connected to an artificial vascular system and provide electrolytes, antibiotics, amino acids and glucose to the wound. The dressing keeps the wound clean and sterile, and provides nutrition for the skin stem cells to encourage them to regenerate new skin. This seems to be a rip off from the Nat Geo show Explorer that was aired last night. The video is directly taken from there. Physorg should do a better job to acknowledge this. These types of advancements bring tears to my eyes. Really, I'm not exaggerating. I love to see science and technology being used for it's true purpose; making life better for humanity. PhysOrg actually got the info from the University of Pittsburg, the same place that the National Geographic went for their information. Imagine when we're saying "Four days to heal? Those were the dark ages!" Not to undermine the value of this achievement, but that's what so great: medical science just keeps getting more amazing! It's amazing how good his scarring looks. It's like a tan. Is it only 3rd degree burns that disfigure you? And you should realize that physorg doesn't write any of these stories. at least not that I know of. This is just a place where articles from all sources are regurgitated with only limited consideration for content. Dont get me wrong, I like physorg, just dont mistake it for journalism. This article was great, by the way. It reassures me as a firefighter that if something bad happens I might not have to live life as an alien from an episode of Dr Who! I always knew someday wed be better at healing burns. A good day for science and a good day for these heroes in Pittsburgh. Wow! "Praise science" is an understatement. When I see this in actual practice I will be more impressed. There is a glut of overly optimistic reports of new medical care that once its reported falls into a news black hole never seen again. I may be a bit pessimistic but better so then self delude myself into a state of false belief because of journalist eye candy. A follow up on this article would be great. Actually, it takes longer to fully recover from the burns. We published an article regarding this subject 3 days ago, and due to interest of our readers we contacted Dr Jörg Gerlach who provided us with more information. You can find more information in the update of our article. My retired doctor friend tells me that 2nd degree burns do not result in scars. What about friction, chemical, or even frostbite burns? What about cuts or puncture wounds? What about aged skin? If this process would return some of the skin youthful appearance it would be a great replacement for plastic surgery. Why doesn't have any effect on 3rd degree burns? Third degree burns go deeper in the skin and this seems to only be surface skin. Skin has multiple layers.